Some people consider me mean when I say, “Enough with the kids and everything being about kids. Who will champion for adults wanting to become artists?” Don’t get me wrong, I like kids. I have one of my own. All I’m saying is, I find it discouraging to see such a disproportionate amount of funding poured into schools for art while emerging artists — the kids of yesterday who were the recipients of those same art programs that ignited the artistic spark — are left out in the cold. Here’s what I see. Little Mary and her classmates are given the gift of engaging in the arts either through a class trip to a local theater, or a visiting artist completing a demonstration, or enjoying music class once a week. After one of those engagements, Little Mary thinks, “I want to be an actor” and she means it. Turns out, Little Mary has some talent. Little Mary works hard throughout her school years. Not only does she attend her regular school but, as she gets older, she attends acting classes, voice lessons, and possibly dance lessons. For some lucky Little Marys, these lessons are at low cost or even free because of arts funding for kids. For most, Mom & Dad have to spend a small fortune. (But hey, Mom & Dad also pay for Little Jonny to become an Olympic swimmer.) Little Mary graduates high school after being the lead in all of her school’s theater productions and performing with a few community theater groups. Mary, as she is now known, heads off to college as a theater major. Four years go by, and Mary has a degree. She quickly sets out to enter the job market in which she has earned her degree. Mary’s friend, Susan, has a degree, too. It’s in Liberal Studies because Susan couldn’t decide what she wanted to be when she grew up. Mary lands her first professional “gig.” So does Susan. Mary is part of the ensemble in a new musical and it pays $500 for her total service which lasts about eight weeks needing her to log approximately 90 hours of in-theater work time, 16 hours of lesson (acting/singing/dance training) time, and 14 hours of at-home practice time. Susan landed a holiday sales clerk position paying $9.00 an hour, 20 hours per week and lasting eight weeks. Do you see the problem? Let me clarify: Susan working 20 hours per week for 8 weeks at $9.00/hr makes $1,440 while Mary works 15 hours per week for 8 weeks for $500, or about $4.17 an hour. While Susan is assisting mature ladies in finding a complimentary scarf for their new coat, Mary is participating in repeated, physically demanding endeavors to provide enthrallingly beautiful entertainment to you. How many kids do you think would set a goal of becoming an actor if they knew they were going to work their butts off, day in and day out, to be paid a measly $4.17 an hour? What society essentially does is lure kids into dreaming of becoming artists and, when they do, underhandedly demonstrate that it was a stupid career choice. Sure, one in million go on to reach the heights of stardom while packing away big, fat paychecks for singing, Let it Go, or playing a spy in the next Mission Impossible movie. Sadly, most artists, especially emerging artists, hold one or two side jobs while also working on two or three shows at a time, without even coming close to being able to afford the basic needs – like food. This is WRONG! Oh, so terribly, WRONG! And, Kevin Spacey agrees with me. Mr. Spacey recognized the needs of emerging artists and started a foundation to address those needs. The Kevin Spacey Foundation aims to train, support and mentor emerging artists in the performing arts and film. Through grants, KSF enables emerging talent in the performing arts (drama, dance, music and film), the art practitioners of the future, to realize exciting, innovative creative ideas. The KSF Scholarships give anyone wanting to attain a higher education in the arts the chance to attend partnered universities via financial support and exceptional learning experiences. But, why only Kevin Spacey? Why don’t federal, state and local governments, as well as art organizations, funders and supporters see (and meet, or at the very least, partially meet) the needs of Emerging Artists? I’m am so very happy that I, as Executive and Producing Artistic Director of Bootless Stageworks, can be a champion for Emerging Artists. Bootless operates on a shoestring budget (<$35k annually). We receive a small grant (<$5k) from the State’s Art Council and no corporate funding. Why? Because we’re not for the kiddies. Our ability to pay our artists comes from ticket sales and flat out begging (or, as we call it, donor development). We don’t pay our artists anywhere near what they are truly worth. 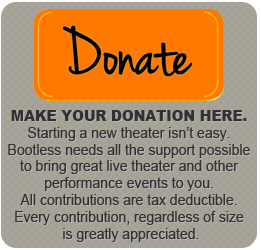 I’ve set a goal – to raise enough money so that Bootless can pay Emerging Artists a scale wage each and every time they work in our theater. Reaching this goal will take time, and I may become frustrated but, I will not give up. Emerging Artists are counting on me (and Kevin Spacey). I ask everyone reading this to take a moment to think about what it means to be successful in reaching a goal. Reaching a goal requires various types of support from others. Emerging Artist deserve our support. Emerging Artists are just as important to our future as the kiddies. My generation has a duty. After all, we ignited the spark. Don’t put the fire out. Let it burn bright for all to see.